How often do you have your caravan serviced? Our new video looks at the importance of getting your pride and joy serviced and what’s involved. So, in this month’s community poll, we’d like to know how often you have your caravan serviced? There are four options to choose from. Simply pick one and we’ll report back the results in February. As always, feel free to leave any comments you have about caravan servicing and why you think it’s important. Or, if you have any stories to share about having your caravan serviced, or if you’ve haven’t had it done, why not? Poll: Do you go wild camping off grid in your motorhome? My unit is serviced every year. There are service agents that don’t ‘charge the earth’ for what I would call a good days work that includes a complete habitation check and full service to the running gear. I would hope that the drum brakes are removed every time and checked. I restore old vehicles and drum brakes are checked to see if they run out of ‘true’. This is done by spinning each wheel and applying the brake gently to hear if there is a slight ‘chuff’ ‘chuff’ on a brake drum binding at a particular point. Brake drums out of ‘true’ can be machined ‘true’ again (round, if you want) if not too oval shaped. Drum brakes generate a lot of heat in a short space of time when under braking conditions and its this heating and cooling effect that distorts the drums. Whilst I AM obviously in the minority here I stand by my views- but especially for Mr Duguid I would like to clarify one or two things,my caravan is not new but it is often mistaken as being new due to the way I look after it,removing the wheels, draining pipework,cleaning and fitting a winter cover does not make your van in any way safer or more roadworthy-you can do all those things and still not have it serviced! With regard to wheels and drums etc I think you will find that very few if any vehicle manufacturers require wheels etc to be removed annually requiring only visual checks,Its not what I think Its what I know with working in the motor trade-by the way drums do very much still exist as even with disc brakes (disc being the more common now admittedly)the handbrake is often an inboard drum/shoe assembly-wheels are a must!I think you would be sacking many mechanics if you really knew what you where getting for your money/service and thoroughly read/witnessed what you have actually had done as oppose to what you think has been done.I also could go on but I wont other than to say that I have a Hgv1,car(advanced driver training with blue light experience) and motorcycle licence all unblemished.I drive many many thousands of miles a year so road safety is also very very important to me.I dont need good luck as I feel I have the adequate driving/mechanical skills to make sure that when I go out on the road I nor my outfit is a danger to myself/family or any other road user(so fear not if you see me coming towards you) unlike some “shiny” outfits that have people behind the wheel with nothing more than blissful ignorance on their side. p.s. My van is annually service as per manufacturers spec to satisfy the warranty conditions and will continue to be serviced even when the warranty expires and if you do see a wheel I very much doubt it will be mine-I have a torque wrench!!!! I’m inclined to agree with all previous comments supporting annual servicing of our ‘vans. I would suggest that many of us (I am one) are not specialised enough to carry out the technical, gas, electrical and miscellaneous engineering related inspections/repairs necessary to ensure we are operating our ‘homes away from home’ safely. Safe travels everyone. When I bought my caravan it was already seven years old and everything looked and seemed ok so off we went on some short trips. Even though nothing ever happened I was never very happy in my mind that there was not just something, so, just before going to France I put two new types on after reading some articles, that in itself give peace of mind. In June 2018 not being satisfied I left it in for a service along with having a set of movers fitted. When on picking up the van you could even see what they had done. They replaced the flexible gas pipe etc. and done a damp check to find that I had some damp in one of the corners, (this will be fixed at a later date)as they temporarily sealed it. It was a Great job and well done and now we can head off to Spain with that peace of mind. After all the problems with a lunar caravan I have had from being new it’s a good job it was serviced just for the warranty side of things as well as the safety side. Mr Markley has a very poor view of road safety. My van is serviced annually. The wheels are removed at the end of the season, the bodywork is polished the pipes drained down and a winter cover put on. I don’t know where this man is coming from if he thinks the wheels and drums (not many cars have those now)should not be taken off a car annually. I would be sacking the mechanic if he didn’t remove them during a service and the same applies to a caravan. Safety first. I could go on. Good luck mate – I hope the wheel don’t come off. I think an annual service should be compulsory, like a vehicle MOT. Faulty gas connections, out of life tyres, worn brakes are all potential killers. I prefer to make sure my ‘van is in tip top condition before I risk my life towing it! I think the annual caravan service is a complete rip off-most vans travel relatively small mileages per year yet have to have a full chassis service including wheels off-you would not buy a car if it had to have the wheels and brake drums off annually-if a van cannot go reasonable mileage (say 10-15000 miles)between service then maybe we should all be questioning what sort of materials are being used in their construction and what we are being sold.The habitation check is as bad, remember most of what is done is a “visual check” not a service and involves nothing more than we should all be doing any way for our own and others safety. In my opinion the only thing that should be required annually is a gas and damp test to maintain warranty/safety with a full service being required no more than once every 3yrs or if you are a more high mileage person sooner but at your discretion.If you are not capable of checking your lights/tyres fittings etc maybe you should question why you are towing in the first place and how safe your towing vehicle is? I am a time served hgv mechanic with many many years experience and realise that not everyone has my capabilities but in all honesty most of it is common sense and if in doubt you can then always refer it to a workshop-annual servicing in my opinion is just a clever ploy by manufacturers and dealers to tie you in to more expense for as long as possible. 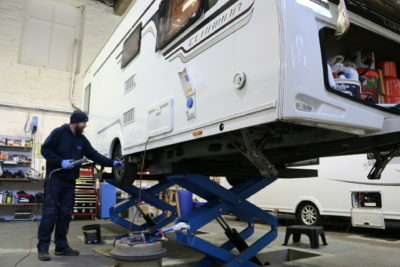 All caravans and motorhomes should be serviced each year if used as both electrical and gas connections can become faulty through the winter. Also the water system ought to be checked and sterilised before use after a long storeage period. Tyre pressures should be checked and advisory damp/water ingress check carried out too. I have my caravan serviced annually not only for peace of mind that all is in order but also to support insurance and warranty etc. I would also like to think that owners check lights & tyres etc before each trip. Well worth checking at least once a year are the normally out of sight connections for the running lights, I noticed last year that the insulation covering the connection for one of the side lights was starting to ‘peal’ off, a quick clean to ensure everything was dry some insulating tape and job done. The old adage ‘prevention is better than cure’ comes to mind. I always have my caravan serviced once a year normally around the time I purchased it, it is always safer especally as all the running gear, gas and electrics are checked and if there is anything wrong it can be fixed before we go away. It’s pretty much essential to have a caravan serviced in order to keep any warranty valid. What REALLY grips me is the fact that it cost considerably more to have my caravan serviced than it does to have my vastly more complex car serviced. I would like to be able to say “Service the brakes and check JUST the safety of the gas/230 volt appliances, I will check everything else” and be charged less (because less time is involved) but that’s not an option is it? We only use our caravan once a year for fairly long trips. Last year to St Tropez Taking in the lot & Loire on the way back. Probably 3500 miles. Do we need an annual service?